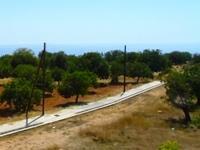 Tremithousa is a village just north of Paphos, 1 km from the Paphos to Polis road. The village sits between Mesogi, Tala and Emba and all essential amenities can be found within the village, including tavernas, small shops, schools, church and banking facilities. With Paphos Town just a few minutes drive away, properties are ideally placed for permanent residency or holiday. "Amazing Views from the 2 Upper Balconies"
"Easy Walking Distance to Local Amenities"
"Detached Villa on Corner Plot"
"Walking Distance to Local Amenities"